Hardwire (120V) Talking Combination (Smoke and CO Alarm with 10yr sealed battery backup . Never need to replace the battery for the life of the alarm will interconnect with all Kidde models. Airthings Wave will provide you with detailed information about radon, temperature and humidity levels right on your phone. View daily, weekly, monthly and yearly measurements in the free mobile app. Use the data to take the necessary steps to protect your home and loved ones from the dangers of radon gas. The importance of a long battery life, coupled with the requirement for an easy-to-set-up connection, made us go for a low-energy Bluetooth solution. 2 AA batteries will provide you with approximately 1.5 years of peace of mind. When you are within range of the unit, Wave's data will constantly update in the app. You will receive notifications when radon levels are high or when the battery levels are low. When radon levels are dangerous you can also receive notifications via email. Suitable for use on Class B (liquids & gases) and Class C fires (energized electrical equipment). The 468031 Home Series white fire extinguisher is fitted with a pressure gauge that provides at-a-glance status, is manufactured from lightweight aluminum and a tough nylon valve assembly. "BC" rated fire extinguishers won't fuse with and damage metal surfaces, making clean-up easier and less costly. Digital Carbon Monoxide Alarm that allows early warning signs of Carbon Monoxide in your home with displaying low levels so your family can react before harmful level are reached. Ideal for bedrooms and hallways. 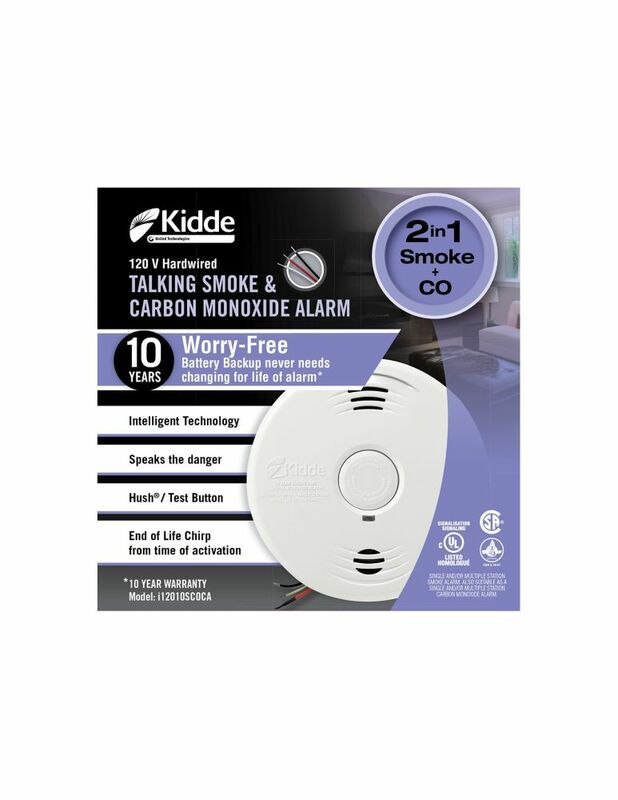 Worry-Free Hardwire Smoke and Carbon Monoxide Alarm with 10-year Sealed Battery Backup Hardwire (120V) Talking Combination (Smoke and CO Alarm with 10yr sealed battery backup . Never need to replace the battery for the life of the alarm will interconnect with all Kidde models. Worry-Free Hardwire Smoke and Carbon Monoxide Alarm with 10-year Sealed Battery Backup is rated 3.2 out of 5 by 9. Rated 5 out of 5 by jkfpilot from SUPER EASY TO SWITCH OUT THE OLD ONE Thankfully manufacturers keep their core line based on a common chassis - my previous KIDDE alarm time expired; it was basically unplug the old one, plug in the new one, twist lock it in place, test it and leave it to work. Rated 2 out of 5 by Sharon from Cannot turn off the false alarm I bought the unit 4 years ago. The unit was supposed to work for 10 years. It starts a false alarm after a power outage at my home. I cannot stop the loud noise, and had to take it down and check the whole unit. Only one place at back can turn off the alarm, and the turning off is permanent. 10-years worry free? don't believe it. Rated 5 out of 5 by Cool Cruiser from Works great! Easy to install Installed this quickly and didn’t have any difficulties. This product linked with my existing hard-wired Kiddie alarms. Rated 4 out of 5 by Mentors from Great Combination This is perfect, especially if you already have a hard wired smoke detector, simply replace it with this two in one CO2 and Smoke Alarm Combined. Rated 1 out of 5 by BobO from lived 1y of 10y life. No way to reset malfunction This expensive device is meant to last 10years, however after a routine test (pushing the button on the front) it started to chirp every 30s. There's no power reset feature, thus the only way to stop the chirp is to use the permanent turn off switch. Rated 2 out of 5 by tr00don from Just purchased I have just purchased two of these and installed one of them; I will return the other one. I decided to keep one to see how it works. However, I already have a few complaints: a) The label does not say anything about the bracket type, or options to hook the unit up to the 120 V household electricity. If I had known that it runs on battery only then I probably would not have chosen it. Besides, the Homedepot associate who assisted me with the purchase was positive that the battery is just for backup power. b) After unpacking the item I found out that it's single-use. Seriously, for $60? Or maybe not. There is a "Turn off" switch in the back with a warning that reads "permanently". I expected to be able to turn it off, if it starts beeping, then turn it back on later. The Hush button, which seems to be the same as the Test button, supposedly allows the user to "silence" the unit for about 9 minutes. Can't test that, though, because I am afraid that I might have to disable the unit permanently if it really goes off. c) I ran the startup test, as per instructions. Apparently, all went well and the unit should now be acrtive. But there is a LED on the front that stays off. I expected it to light up green. I mean, all other smoke/CO detectors in my house have a front LED that goes green when in standby; this one doesn't. The information on the front reads "GREEN - STANDBY", so it should be green. Is the device activated and in standby mode? It's very confusing. d) A comment from the manufacturer posted for a similar product, also sold at Homedepot, indicates not to install such a detector in the furnace room or in the basement, unless it's a large room. Doesn't this defeat the purpose of a smoke/CO detector? I think that most furnaces are located in house basements. In my case, although there is a physical separator placed around the furnace, it's not airtight. Ocassionaly, people sleep in my basement; this is the reason why I want to install a CO detector there. Should I or should I not? Rated 4 out of 5 by Mentors from Two in One It is great to have both CO2 and Smoke Alarm in one unit, easy to install. Works great.